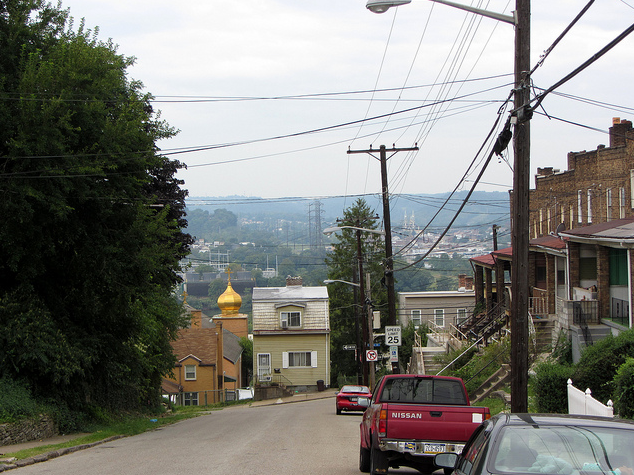 Urban Hike loves to explore new perspectives in Pittsburgh and our September 15 hike in Marshall-Shadeland is no different. Not only will we take in this city neighborhood’s streets and sights from above, we’ll look into what’s below too! Our hike starts early at the ALCOSAN (that’s short for Allegheny County Sanitary Authority) plant that provides wastewater treatment services to 83 communities including the City of Pittsburgh. You’ll never look at a drain the same again. After the ALCOSAN bus tour concludes, we’ll get our exercise on by climbing some of Marshall-Shadeland’s hills. This hike will be a bit brisker than most, with fewer stops to outweigh the extra time we’ll spend on the tour at the beginning. But just in case you’re not convinced to come out, rain or shine, with us… we’ll sweeten the deal just a bit more. A pit stop at a neighborhood ice cream and coffee café. Yum. If you are coming on the hike, we ask that you please RSVP to Emily at emilykeebler(at)yahoo.com by Thursday, September 13 so we can give ALCOSAN a headcount. When: September 15 at 9:30 a.m.
Where: Meet in front of the red LED sign that marks the entrance to the ALCOSAN plant. It’s just past the intersection of New Beaver Street and Tracy St., 15233. Public parallel parking is available on the nearby side streets, so give yourself a few extra minutes to park and join us at the sign. Why: Sewers and sweets?! What’s not to love? What is the cost of attending this hike? Our hikes are free to all attendees. as a hiker i can say they are also priceless. How long do you estimate the hike will take, timewise? Hikes usually take around 3 hours. This one might be closer to 4 with the ALCOSAN tour.